from Spain and the U.S.
* Cebuano, Ilokano, Hiligaynon, Bikol, Waray-Waray, Kapampangan, Pangasinan, Kinaray-a, Maranao, Maguindanao, Tagalog, Tausug are the auxiliary official languages in their respective regions. Spanish and Arabic are promoted on an optional and voluntary basis. 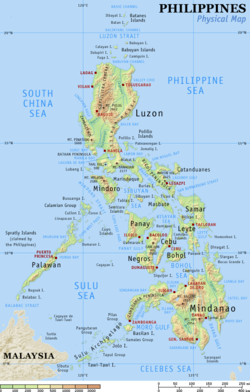 The Philippines ( Filipino: Pilipinas), officially the Republic of the Philippines (Republika ng Pilipinas), is an island nation located in the Malay Archipelago in Southeast Asia, with Manila as its capital. 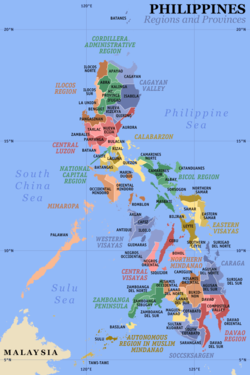 It comprises 7,107 islands called the Philippine Archipelago, with a total land area of approximately 300,000 square kilometers or 116,000 square miles, making it the 72nd largest country by area. The country was named "Las Islas Filipinas" (Phillip's Islands) by Ruy López de Villalobos after King Philip II of Spain. Spanish colonial rule began in 1565 and lasted for about three centuries until the Philippine Revolution of 1896. The United States gained possession of the Philippines after the Spanish-American War in 1898 and ruled the country for about five decades. 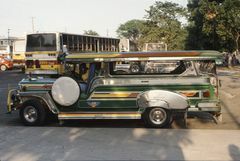 Philippine culture has many affinities with the West. Roman Catholicism is the predominant religion, and Filipino is an official language, along with English. The government of the Philippines is organized as a presidential- unitary republic, where the President functions as head of state, the head of government, and the commander-in-chief of the armed forces. The president is elected by popular vote to a 6-year term, during which he or she appoints and presides over the cabinet of secretaries. 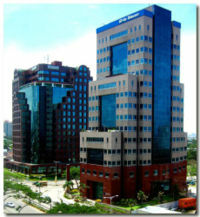 The local climate is hot, humid, and tropical. The average yearly temperature is around 26.5° C (79.7° F). There are three recognized seasons: Tag-init or Tag-araw (the hot season or summer from March to May), Tag-ulan (the rainy season from June to November), and Taglamig (the cold season from December to February). The southwest monsoon (May-October) is known as the "habagat" and the dry winds of the northeast monsoon (November-April) as the "amihan". The country itself is udergoing desertification in place like Sorsogon, Baguio, Davao and the Sierra Madre mountain range. The people of the Philippines are called Filipinos. Most Filipinos are descended from the various Austronesian-speaking migrants who arrived in successive waves over a thousand years ago from Southeast Asia. These ethnic Filipinos are divided into various ethnolinguistic groups, the three most numerous being the Bisaya, Tagalogs, and the Ilocanos. They are genetically most closely related to the Taiwanese aborigines. The Negritos or Aetas are the aboriginal inhabitants of the Philippines, and number less than 30,000 people (0.03%). Filipinos of Chinese descent, who had been settling in the Philippines since pre-Hispanic times, currently forms the largest non-Austronesian ethnic group, claiming about 2% of the population. Other significant minorities include Americans, South Asians, Europeans (particularly Spaniards and Basques), and Koreans. There are also numerous Arabs and Indonesians in the country, especially in Mindanao. According to a Stanford University small-sample study, about 3.65% Filipinos are partly of Spanish, Mexican, European, or American ancestries. 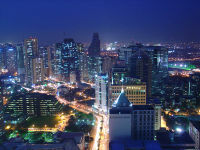 The Philippines is the fifth-largest Christian nation, after the United States, Brazil, Mexico, and Russia. About 90% of all Filipinos are Christians: 81% belong to the Roman Catholic Church, about 5% belong to various Protestant, and another 4% from local Christian groups. Although Christianity is a major force in the culture of the Filipinos, indigenous traditions and rituals still affect religious practice. Approximately 5% of Filipinos are Muslim. They primarily live in parts of Mindanao and the Sulu archipelago. Most lowland Muslim Filipinos practice normative Islam, although the practices of some Mindanao's hill tribe Muslims reflect a fusion with animism. The Muslims have resisted conquest and conversion for centuries by the Spanish and the Americans. Various Muslim groups have been waging a decades-long armed campaign against the Philippine government for political self-determination. There are also small populations of Buddhists, Hindus, and Jews, which collectively comprise 5% of the population. In spite of this, native moral codes, respect of family, veneration of elders, and friendliness, all remain intact. Filipinos honour national heroes whose works and deeds contributed to the shaping of the Filipino nation. José Rizal is the most celebrated ilustrado, a Spanish-speaking reformist visionary whose writings contributed greatly in nurturing a sense of national identity and awareness. His novels Noli Me Tangere and El Filibusterismo originally written in Spanish, are required readings for Filipino students, and provide vignettes of colonial life under the Spanish rule. They give a sense of Filipino identity and historical continuity. Ninoy Aquino, the charismatic leader against the Marcos dictatorship, is a highly revered martyr of the People Power revolution.